Being the co-founder of The Sola Company and initial developer of Sola sweetener, I highly recommend this sugar substitute for sweetening all of your low-carb recipes. I created Sola sweetener because of a personal mission to make a sweetener that actually worked in recipes like sugar. A sweetener that would caramelize and get sticky, help cakes to rise and brown, to help ice cream stay soft and be a one for one replacement for sugar using ingredients found in nature. We clinically tested Sola sweetener and it has been shown to have no impact on blood sugar levels or insulin levels. 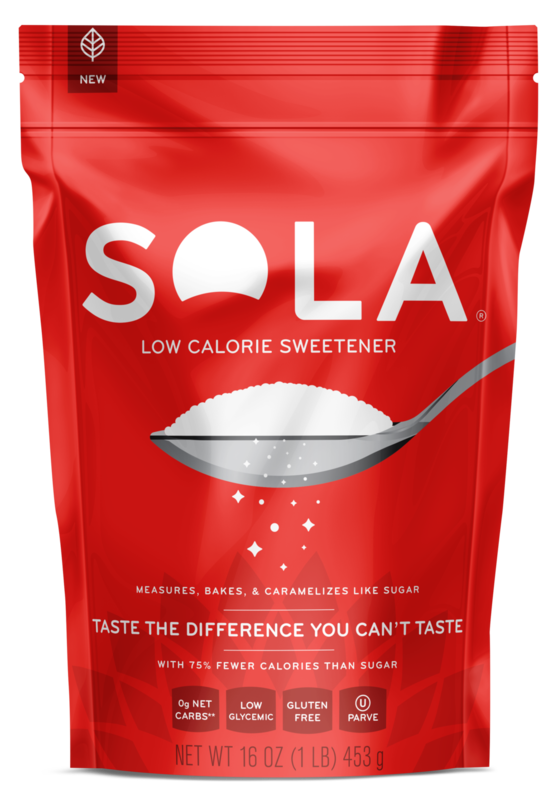 Sola sweetener is comprised of naturally occurring ingredients found in fruits, vegetables and dairy, it tastes just like cane sugar but with 75% fewer calories and 0 net carbs. Using Sola sweetener is simple because it measures just like sugar. Whether you are using standard cups or grams, simply remove the sugar and replace it with the same amount of Sola sweetener. What is sola sweetener made from? If you can't get hold of Sola sweetener, here are some of my recommended sweeteners, which should give you good results.